First of all, let me start by saying that we are very very happy with all the feedback that we have received from all webtexttool users! We are trying hard to add as much as possible in our frequent releases. In this short blog I’ll give you a quick overview of the main updates we did in the past months. If you have any suggestions and idea’s, don’t hesitate to share them with us at support@webtexttool.com Thank you! The competition checker will show you on which keywords your domain is well indexed. On top of that we’ll show you the top 3 competing domains – which also have top-10 positions on related keywords and topics. 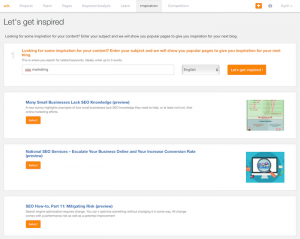 The inspiration module gives you …. inspiration 🙂 Enter your topic and you’ll get a list of blogs that you can read and use as inspiration for your own blog. With Team projects, available on our Business plan, you can collaborate on content. 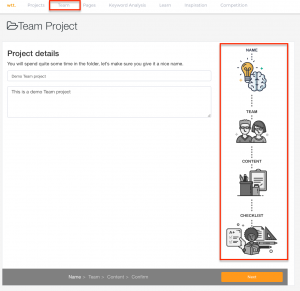 The handy Team project wizard will help you set up a new project: add teammembers, add the content and track progress. The SEO suggestions will tell you if you are using (enough) internal and external links in your content. Previously, the internal link checking only worked when you would use so called relative URL’s. Now you can set the domain of your website and webtexttool will consder all links with this domain as internal links. In My Account we’ve added three small, but frequently requested items. First of all you can now set the default SEO ruleset. This ruleset is used as a default for new pages you create. The default is the Blog / Article ruleset, but if you create a lot of productpages you can set the Product ruleset as default. Next, we’ve added the option to enable the “proces page title as H1” by default – with this option enabled webtexttool will consider the page title as an H1 / heading 1 in the content by default. And on the settings page you can now see the credit renewal date for your account; this is the date that your keyword credits will be reset. We’ve rebuilt the page import process from scratch. Importing and extracting content is still a technical challenge even though it might seem something trivial. What we try to do is extract only the main content from a page, removing the navigation, sidebars, footers, widgets, etc. Because of the many different ways pages can be built, this is not a straightforward task to do :-). However, the import process has been improved massively. We are really interested to hear your opinion on this. And please keep in mind, that the import will work best for real content pages, like blogs and articles (and homepages are always a big challenge). We’ve added a lot of new domains / languages for doing keyword analyses and tracking Goole rankings. The complete list can be found here. Paste-from-Word update : copying content from Word has been improved. A lot of small updates and improvements. Eg. you can now change the keyword directly without going to the keyword analysis module first. In the pagetracker overview you will see the Google domain the pagetracker is set for. 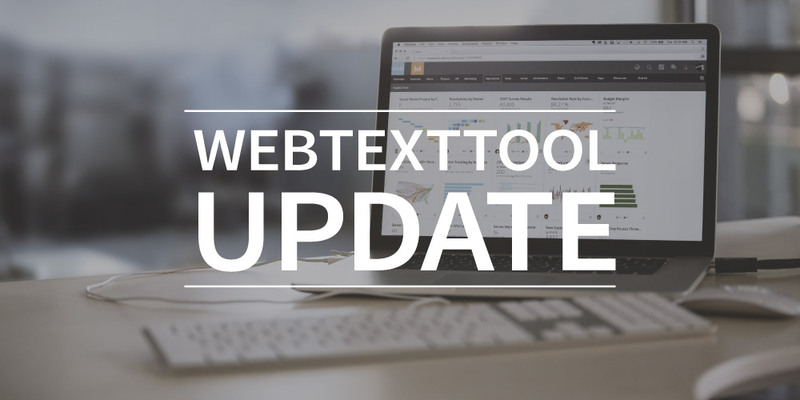 We’ve released the first version of our Word add-in that allows you to use Webtexttool directly within Microsoft Word.. More information here. We’ve spent a lot of time improving and enhancing our plugins. In our WordPress plugin we have added support for a lot of pagebuilders, added a SEO data migration tool (to migrate data from other SEO plugins to Webtexttool so you can disable other SEO plugins) and added Social media sharing tags (no need for a seperate plugin for that anymore). For Joomla we have also added the social media sharing tags and a lot of other smaller improvements. For Drupal we have created the Drupal 8 version of the module. Of course we keep on developing webtexttool. Our mission is to make content creation easy and fun. We love to hear your idea’s and suggestions – please get in touch!